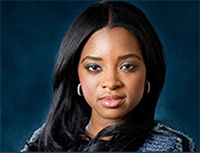 LAWRENCE – The 10th annual Jana Mackey Distinguished Lecture Series returns next month with an activist who served as national co-chair for the Women’s March in Washington D.C.
Tamika Mallory will speak about violence against women and those who hold marginalized identities from an intersectional perspective. She will address the role of guns in perpetuating this violence, encouraging a discussion of effective ways of building power to bring about change. The lecture will take place at 7 p.m. Nov. 7 in Woodruff Auditorium in the Kansas Union, with a reception to follow in the union’s Big 12 Room. Mallory is an advocate and speaker on issues related to equal rights for women, health care, LGBTQIA rights, ethical police conduct and stronger gun restrictions, with a focus on creating space for underrepresented voices in social activism. She worked closely with the Obama administration on civil rights issues and has been nationally recognized and awarded for her work. Her message related to the intersection of gender violence and gun violence is particularly relevant and timely. There will be a follow-up discussion to Mallory’s presentation, titled “Coming to the Table to Make a Difference,” from 4 to 5:30 p.m. Nov. 10 in Alderson Auditorium in the union. This event is a collaboration among the Emily Taylor Center, Students United for Reproductive & Gender Equity, Multicultural Student Government and Student Senate. The University of Kansas established the Jana Mackey Distinguished Lecture Series in honor and memory of a former student. Mackey, a feminist and activist, was murdered in 2008 by her ex-boyfriend. She dedicated her life to social justice and equality for all women. She was also the president of the student activist organization now called Students United for Reproductive & Gender Equity. Mackey was well-known in Kansas for her advocacy for women’s rights and victims of sexual assault and domestic violence. The lecture series strives to raise awareness about issues that were important to Mackey. The Emily Taylor Center for Women & Gender Equity, Students United in Reproductive & Gender Equity, Mackey’s family, and other campus and community organizations collaborate every year to bring a guest speaker for the lecture series. Past lecturers include Pulitzer Prize winner Connie Schultz; author and advocate Leslie Morgan Steiner; director of the NW Network for Bisexual, Trans, Lesbian, and Gay Survivors of Abuse Connie Burk and television host Melissa Harris-Perry. The lecture series’ goal is to have difficult but necessary conversations about sexual violence and promoting gender equity. This lecture series is sponsored by the Emily Taylor Center for Women & Gender Equity in collaboration with the departments of African & African-American Studies, Communication Studies, Political Science and Women, Gender & Sexuality Studies; Dole Institute of Politics; Jana’s Campaign; Multicultural Student Government; Office of Diversity & Equity; Office of Integrity & Compliance; Office of Multicultural Affairs; Pepsi Program Funding; the schools of Law and Social Welfare; Sexual & Gender Diversity Center; Sexual Assault Prevention & Education Center; Sexual Trauma & Abuse Care Center; Student Senate; Students United for Reproductive & Gender Equity and Willow Domestic Violence Center.